The serie 6000 is our latest wine cabinet generation. It combines cutting-edge technology, clever design and respect for the environment. 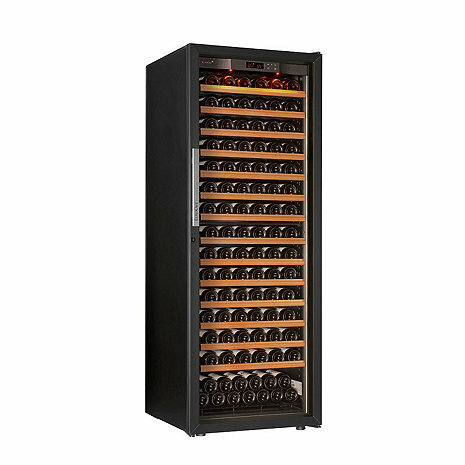 Thanks to its temperature range of 41°-68°F, this single-temperature cabinet stores your wine in optimal conditions or can be transformed into a wine serving cabinet for red or white wine. This model from Eurocave Professional's Series 6000 range is a design and performance product which will meet the requirements of all professionals. By combining several wine cabinets, you can precisely manage the serving temperature for your full wine list. Placed side by side, your cabinets will also show off your wines. The Premium pack: it is made up of 14 sliding shelves for a capacity of 182 bottles. A wine cabinet that will delight Professionals that looks for design and performance. This range listed A + product respects the environment (6000 Series allows to save up to 55% energy compared to a traditional wine cabinet) and brings together all the developments of EuroCave products recently developed : better insulation, more efficient new glass, shelves design with brake, full lighting equipment ... The 6000 Series, composed of 5 models satisfies all professional needs through a system of options that allows a product customization. Suitable humidity levels - It is essential to maintain suitable humidity levels, between 50 and 80%. The ideal humidity level is 50 - 80%. Below 50%, the cork could dry out causing the wine to leech out. Above 80%, condensation could appear on the bottles and the labels could peel off. Mold may even develop if there is insufficient air circulation. *A Note About Bottle Capacities: Wine Enthusiast's stated bottle capacities is always based off of storing all standard Bordeaux size bottles, which are generally 12"H and 2-7/8"W. 750 ML bottle sizes can vary greatly in both height and width, so be sure to check the bottles in your collection as larger bottles (i.e. Pinot Noir, Burgundy, Syrah, Champagne, etc.) will lower capacity. If up to 50% of your collection consists of these taller/wider 750ML bottles, capacity can be lowered by 10-15%, if over 50% of your collection consists of these taller/wider 750ML bottles, capacity can be lowered by up to 25-30%. *A Note About Bottle Capacities: Wine Enthusiast’s stated bottle capacities is always based off of storing all standard Bordeaux size bottles, which are generally 12"H and 2-7/8"W. 750 ML bottle sizes can vary greatly in both height and width, so be sure to check the bottles in your collection as larger bottles (i.e. Pinot Noir, Burgundy, Syrah, Champagne, etc.) will lower capacity. If up to 50% of your collection consists of these taller/wider 750ML bottles, capacity can be lowered by 10-15%, if over 50% of your collection consists of these taller/wider 750ML bottles, capacity can be lowered by up to 25-30%. This item ships directly from the manufacturer. Please allow 12-16 weeks for delivery. Select items will have additional shipping charges, please see above for this item's additional shipping charge.